I was contacted recently about reviewing a product in the works with Cursive Logic. I reviewed them with the Homeschool Review Crew in 2015 when Ruby was learning cursive and now they are working to make another product following their unique approach to teaching handwriting – this time for adults! 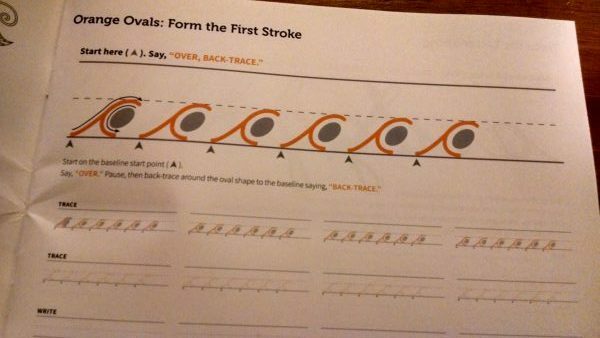 Cursive Logic has a fascinating approach to begin with – one I know adults have already utilized to learn cursive, either for the first time or to improve what they wish to be better at. But now, they are working to add The Art of Cursive Logic to their line up. It’s an adult coloring book… And more! It has beautiful pictures to color following the fun trend of adult coloring books, while incorporating practice of the strokes that Cursive Logic has used to teach so many people to write beautifully. My own daughter is included in that group. Ruby loved Cursive Logic and learned painlessly with it. “Learn to write cursive in 4 simple lessons while you relax and color.” is the statement they make, and I’m pretty impressed with the concept. The color portions of the book reminds me of the Bible journaling concept I’ve read of, admired, but with coloring instead of requiring artistic talent with drawing that I do not have. It has pictures with writing practice incorporated into the picture, while including a quote to trace that is beautifully wound into the picture. Cursive Logic has a Kickstarter campaign going through February 22 to raise funds to print this latest creation, The Art of Cursive Logic. There are several reward levels for backing their campaign including a copy of the book as soon as it’s published and three coloring sheets at the end of the campaign via email for $15 – a pretty good reward for a pretty good price in itself! There are several other levels to choose from as well, with a list of very cool rewards. If you’d like one of the Cursive Logic coloring pages free via download, they are offering one in exchange for a Facebook share here. Cursive Logic has an ingenious concept. I can’t wait to see where they go from here! I received a sample of The Art of Cursive Logic in exchange for my honest review. All opinions are my own.